The workstation is connected to the company's network and Drive O: was here when the initial install occurred. So I take it that the O: drive no longer exists? In order to install a new service build PrimalScript does a quick uninstall of the previous build while preserving all your data and settings. Then it installs the new build. If the MSI of the currently installed build is no longer accessible you should try a manual uninstall or remove the previous version's Windows Installer references from the registry. If a manual uninstall is not working and you need assistance with the latter please let us know. Then install the new build by running the setup executable. 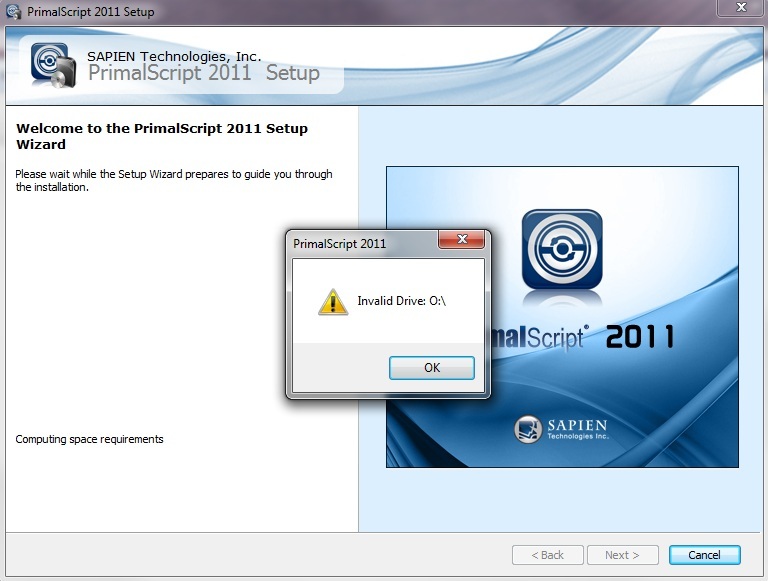 I am installing on a new machine, PrimalScript2011 Build 150 was never installed on it and Drive O: is mapped. PS2011 is not listed in Programs that are installed. The install process does not get that far. The "My Documents" was moved from the local drive to the network drive. Would this impact the install on a new machine? Got the following entry in Application Event Viewer. If the installer has no access permissions this is one of the potential error messages. The installer also requires elevation. I can't tell if you running under a non-admin user and enter the credentials of an admin account when prompted for elevation. If that is the case, can it be that the account you provide does not have the O: drive mapped?